My mission is to help people learn to love the gift of music. 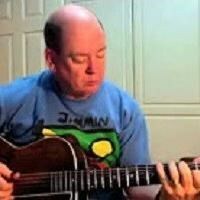 Rick Roe has been teaching guitar since 2001, from age 10 up. He is at home in a huge variety of styles including classic rock, heavy metal, blues, rhythm n’ blues, jazz, bluegrass, and solo/fingerstyle acoustic. He specializes in the fundamentals of music and guitar. He holds degrees from the University of North Texas and from Southern Methodist University. Rick has been playing guitar since the age of seven. When he is not playing guitar, Rick leads a classical music ensemble called The Advent Project, and takes care of Starbuck, his Samoyed. Request Lessons with Rick Roe today!